For a few days I've been doubting this sweater. The front panels especially were on my mind and I couldn't decide if my doubts were truly something of relevance. Well this morning, with a fresh mind and a good night's sleep, I've decided that this sweater is just not for me. My knitting history is decades old and I know if I'm not completely happy while it's being knitted up there is a slim chance I'll love it off the needles. I loved the construction of this sweater and the shoulder fit and length is perfection. My gauge was spot on-love when that happens. The front panels have too much fabric and not enough drape and hit in all the wrong places on my body. No amount of blocking in the world is going to change that. My doubts started when I knit the ribbing of the panels and then the ribbing of the neck line. Last night I was going to start ripping but I forced myself to sleep on that drastic decision. Altering the pattern requires ripping ribbings and I'd just rather have a fresh start at another pattern. This is not the first sweater I've frogged and it won't be my last. Sometimes that is what a knitter has to do. For now I'm setting it aside and I'll work on something small. Tell me about your change of heart projects? Oh noooo.... I believe all of us have been there at one time or another, but I'm still sorry to hear about your sweater. You were making such progress, but in the end it really makes more sense to start over then to continue on with something you won't wear. 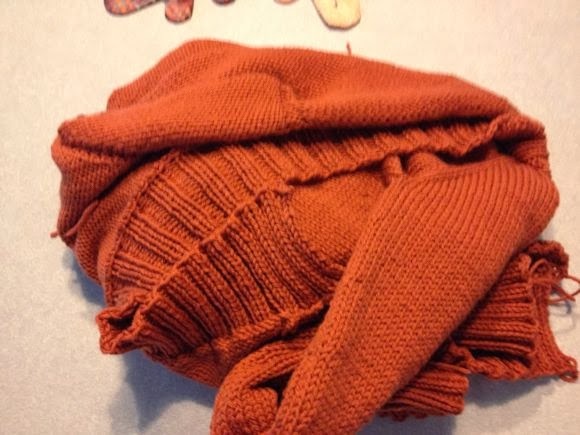 I have not yet frogged a sweater, but I have been completely dissatisfied by one or two which resulted in me getting frustrated every time I wear it (or see it). So it amounts to the same thing- a sweater that bugs the heck out of me. At least by frogging it, you get the yarn back. The longer I knit the more accepting I am becoming of frogging if I need to - without even getting too upset about it! No point in wasting good beautiful yarn on something that will just sit at the back of your closet! I think that looking at it each time I opened the closet would drive me crazy! I get it Karen and know you will find just the right pattern and then knit yourself the perfect sweater. Oh no, I am so sorry! But good for you for knowing what is the right thing to do and listening to your intuition. I haven't ever undone the projects I've frogged, but maybe you could do it and use that pretty yarn for another project in the future? It's a shame that we can't try sweaters on before we make them. But if it's not quite right you would probably end up not wearing it. I hope you find something nice to make. I've had lots of changes of heart recently. But I'm so glad each time I've made a fresh start. I'm sure you'll find something lovely to make. karen, when you have a moment could you let me know the make and colour of the green/yellow yarn in the last post. The one you are using for the test knit. i've done that and i haven't ever regretted the decision. good for you! Oh no!!! That is too bad, and as hard as it will be to frog it, if you are not going to wear you might as well knit something else up that you will wear. well, the best part is...you just found much more knitting with a fabulous color yarn. I've had more change of heart projects than I care to count. my latest was a sweater whose yarn turned into a cowl that I have worn and worn and worn....one of the best changes I've made in a real long time. I know you'll find what this yarn wants to be. I simply wrote that my changes of heart occur at the beginning of a project when I find myself casting on, knitting, frogging, casting on, knitting, frogging; try as I might i cannot move on with the patterns and I find myself making mistakes, so I give up. Until now I've never had a change of heart beyond the starting point. Oh, this make me sad, Karen! But I know you are so experienced that you know what works best. It is very lovely yarn - I know you will turn it into something beautiful! I hope you find the right pattern. That yarn is so beautiful and I hope to see it as a sweater for you. Ahhh, what a bummer. But, you are so very brave to admit that it wasn't right and to just move on. It stinks when that happens, but I've done it, too. I'm so glad that you posted about this! Oh Karen, my knitter's heart is aching! I've only ever done this with smaller projects, never with a sweater. thanks for your honesty here, I will have a place to return to and cry should something like that ever happen to me. Now I'm looking forward to see what you will be making with this yummy orange yarn! so glad I am not the only one who has these thoughts...especially on sweaters.....fit is sooo important!! Now you can get excited about a new cast on!! I have a cardigan I knit out of hand spun and I just hate the way it fits. It is complete but I want to frog it and knit something else with it since I love the yarn so much. It was only the second sweater I had knit for myself so I didn't have the common sense to cut my losses when I knew it was going wrong. Oh well. As long as you feel good - go ahead and frog away! I hear you. There's no point in putting all the work and money into something that is going to irritate you every time you where it. Or worse yet, you won't wear because you know it will irritate you. I just frogged a sock. The colorway wasn't as variegated as I thought it would be -- it's more self-striping -- and the pattern had a delicate openwork pattern up the side. The two just didn't mesh well. Thanks for sharing this. It's good to know it happens to everyone now and then. I will take a look at them with new eyes, inspired by this post! Oh. My. That is a lot of work to rip out! Was there not anyone you could have gifted the sweater to that would appreciate it? Oh no!! So near and yet so far! But no point in pouring even more work into a sweater you won't love. Sorry to hear about this, but you're right, if you don't like it you won't wear it, no matter how much work you put into it. Brave move! Oh, I started reading the post with the picture of all of the frogged wool and had to find out more about it. I'm sorry it didn't work out - I hate it when that happens - but kudos to you for knowing yourself and deciding to make something that will make you happy. :) This happens to me a lot - I usually don't frog for awhile (delaying the inevitable?) but just take my needles out and move on to something else. Can't wait to see what else you make with that yarn!